Do you like thrilling adventures ? 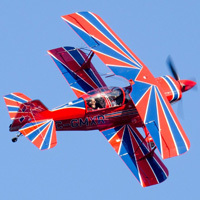 Come experience an aerobatic flight aboard a Pitts Special biplane! Stalls, looping, spirals, spins, and more ! Duration of flight: 30 minutes. Take place in a powerful biplane aerobatic aircraft with a stunt-flying instructor for 30 minutes and live the unique experience of an aerobatics flight! This introductory flight will allow you to live an emotion rich experience aboard a Pitts, a well known aerobatic airplane. This airplane can reach 340 km/h a make you experience acceleration forces up to 6 positives g and 5 negative g! You will try several aerobatic maneuvers like inverse flight, barrels, looping and several more. Your friends and family will be able to watch your aerobatic flight from the ground. If you wish, you will be able to try to fly the aircraft under the supervision of your instructor. Are you ready for a good adrenaline dose? Activity available from april to november. An unforgettable gift. Maximum weight of 200 pounds (93 kg). * Available as an option with this flight: a white smoke trail!